We were very lucky to spend a wonderful week in the Gascony region of France this summer. Gascony is probably, most known for their delicious food; it really is a melting pot of regions, from traditional French dishes to rich hearty country fare, with touches of the spicy Basque region. One of my most memorable meals was one prepared by our friend, Christiane. Christiane is the wife to our friend, Dominique, the charming butcher in our “Who’s Your Butcher” video. She is a delightful woman, who is always smiling, even when she is getting down and dirty in the lab, rolling roasts and making these adorable pork parcels. I remember one meal where she served some of their wonderful pork cooked with fresh summer peas, that memory is pressed into my mind as one of the best food meals I have ever had. I immediately remade the recipe for French Pork Parcels upon my return, and am sure you will love these delicious little presents as well. It is funny how you can watch something over and over again, and every time, you see something new. That is what happened the other day when I was watching the video (again) and noticed Christiane rolling these delightful little packets; dinner came to mind. Unfortunately, I was not able to get the beautiful thin slices of fresh pork, nor delicious homemade bacon, on such short “thought”; but, I did improvise. I used thinly pork loin chops, and pounded them until they were paper thin, which was about the same time I noticed the new markings in our butcher block table!! I seasoned ground pork, with salt and pepper and freshly minced thyme and rosemary and then wrapped the chops around the ground pork, finishing it with strips of applewood bacon. Lightly browned on the stove-top, doused with some white wine and baked until caramelized and golden. There is so much flavor in this dish that you want to keep the peas simple; sauteed shallots, a bit of the juice from the pork, a pinch of thyme and a sprinkle of Maldon salt. Pound the pork chops, until very thin. Mix the ground pork with the fresh thyme, rosemary, kosher salt and pepper (I did not measure, I just eyeball it, depending on the flavors we like). Put a small ball of the ground pork mixture in the middle of the thinly pounded loin, just enough to fill it; leave enough room to be able to wrap the loin around it. 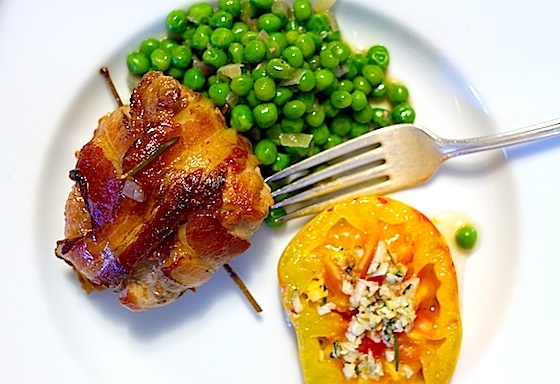 Wrap a strip of bacon over the rolled pork – one strip in each direction, you will use two strips per loin chop parcel. If you have cooking twine, gently tie the parcel, to keep it all together. I did not have twine, so I used the stalk from the rosemary, sharpened one end and wove it through the parcel. Heat a little olive oil in a deep dutch oven over medium heat, gently sear the parcels, until golden on each side. Turn off the heat. Pour in the wine or water, and slide into the oven. Cook for about 30 – 35 minutes, until cooked to your liking. We prefer our pork a little pink, not white. Remove from heat, cover with a lid and let sit on the stove top, while cooking the peas. In a deep frying pan, heat a little olive oil, add the shallot and cook until soft, about 10 minutes. Add the thyme and the peas, still until glossy, about 1 minute. Add the juice from the pork, sprinkle with Maldon salt, to taste. Gently heat for about 3 – 5 minutes over low heat. The peas will still be bright green but heated through. 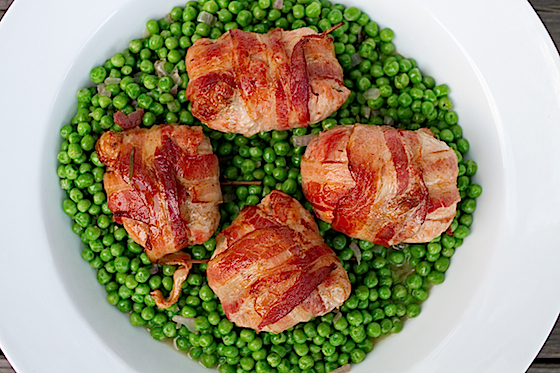 Pour the peas into a deep serving dish, gently lay the pork parcels on top, pouring any leftover juices from the pan over everything. 9 Responses to "French Pork Parcels"
The first photo is killer! So gorgeous. You have me craving for some of these. Wrapping bacon around pork chops is sounding like a really good idea to me... since I've pretty much destroyed every pork chop I've ever made! They always turn out so darn dry. Bacon might help :) I'm jealous of your trip to France! Nice idea. They sound delicious. Will try them. Beautiful. I plan to try them. Yum! We are going to have to make this when we get our pig! Yes, we're buying a whole, an organically raised heritage pig from a farm in Oregon. We were going to butcher it too, but now there's no time, so that will have to wait for the next one. Still, we're going to have LOTS of pork and I'm adding this to the list of things to make with it. I think it will be perfect for a dinner party. Wonderful!. Im in a pork frame of mind today and getting ready to so some more pork projects. This looks heavenly! You make me dizzy with pork love. I want to go see Kate and Dominique in France! I want to learn these dishes from experienced hands! Bee-yoo-tee-full! This is genius - sweet peas with indulgent pork, yum-meh! Thanks for sharing this recipe....I hope to get a chance to pop by Gascony someday!